DVDs and CDs about Saint Therese of Lisieux. In this 35-minute documentary, Fabrice Maze recounts the 24 years of the earthly life and the extraordinary posthumous life of St. Therese of Lisieux. We share in the footsteps of her family, the places of her childhood and adolescence, as well as in the daily milestones of her religious life. This is an excellent introduction to St. Therese and a splendid resource for groups whose sessions don't allow the 90-minute documentary mentioned below. The film is a good background for reading Therese's memoir, Story of a Soul. In French with subtitles in English and other languages. The same DVD also contains a second film, The Basilica of Saint Therese of Lisieux, in which we discover the biggest religious building constructed in France in the 20th century, a symbol of the worldwide radiance of Therese. A bonus DVD includes videos about the making of the two films above. You may order this film online from Seven Doc, a company in France which produces splendid documentaries about spirituality and other topics. I own one and have had no trouble playing it in the United States. I recommend it highly. For more information or to order, click on the image above or click here. See the one-minute and 44-second trailer below. 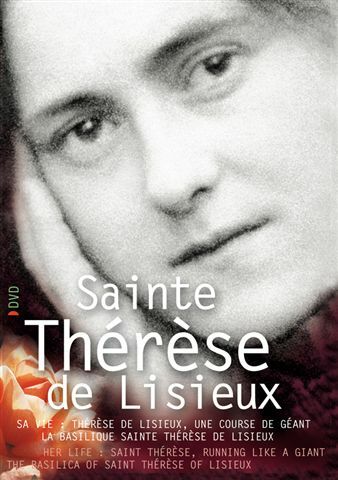 Definitive documentary about St. Therese, made in 1997 to honor the centenary of her death. Filmed on location in France, it gives Therese's whole story in interviews, dramatizations, and long visits to her birthplace, her home in Lisieux, and the Carmelite monastery. The distinguished Theresian scholar, Carmelite friar Bishop Guy Gaucher, provides commentary. 90 minutes. If you have ever longed to see the places where Therese lived and to visit the interior of her monastery, this is your chance. Although this is a region 1, 3, and 4 DVD, the publisher sells it only in the United States. On sale for $17.95! To purchase this DVD, click on the image at right. St. Therese of Lisieux is the most popular saint of modern times, and her "little way" of love and confidence has great appeal to people everywhere. This new film explores why so many ordinary people are drawn to St. Therese. Journalists, scholars, psychiatrists, priests, nuns and scores of people from around the United States reflect on her appeal and powerful message. 55 minutes. To purchase, click on the image at left or click here. This film, directed by Leonardo Defilippis, tells the story of St. Therese of Lisieux, a young girl who fell in love with Jesus Christ and demonstrated a path of spirituality, known as the "Little Way", through the actions of unconditional love, human compassion, and selfless devotion to duty. Starring Lindsay Younce, this moving true story is told in an inspiring way that invites the audience to contemplate and apply such spirituality in their own lives. This DVD contains the following language options: English with optional French or Spanish subtitles 96 minutes.